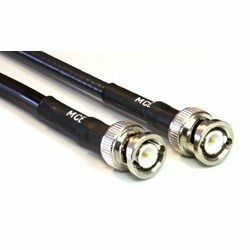 Highly flexible 50 Ω RG174 coaxial cable with only 2.8 mm outside diameter, up to 1 GHz specified. The very flexible coaxial cable has BNC connectors at both ends. High quality version 'Made in Germany' for reliable measurements. High frequency cable 50 Ω CLF200 with double shielding and very low attenuation (low loss), specified up to 6 GHz, can be used up far above. The coaxial cable has BNC connectors at both ends and an outside diameter of 4.95 mm. High quality version 'Made in Germany' for reliable measurements. High frequency cable 50 Ω CLF240 with double shielding and extremely low attenuation (low loss), specified up to 6 GHz, can be used up far above. 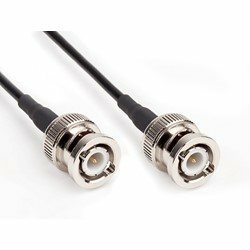 The coaxial cable has SMA connectors at both ends and an outside diameter of 6.1 mm. High quality version 'Made in Germany' for reliable measurements. High frequency cable 50 Ω CLF240 with double shielding and extremely low attenuation (low loss), specified up to 6 GHz, can be used up far above. The coaxial cable has N connectors at both ends and an outside diameter of 6.1 mm. High quality version 'Made in Germany' for reliable measurements. High frequency cable 50 Ω CLF240 with double shielding and extremely low attenuation (low loss), specified up to 6 GHz, can be used up far above. The coaxial cable has a SMA connector on one side and a N connector on the other and an outside diameter of 6.1 mm. High quality version 'Made in Germany' for reliable measurements. The 110A probe cable is designed to connect the 100 series probes to the 150A amplifier or other instruments. This double-shielded cable has good RF performance from DC to 6 GHz. Its narrow diameter gives the 110A cable high flexibility, making it convenient and kink-free when using the probes manually. One end of the cable has a female SMB connector to connect to the probes, and the other end is male SMA. This allows it to connect directly to the 150A amplifier with no adapters. Its narrow diameter gives the 112A cable high flexibility, making it convenient and kink-free when using the probes manually. One end of the cable has a female SMB connector to connect to the probes, and the other end is male N Type. This allows it to connect directly to the Spectrumanalyzer with no adapters. Used e.g. to connect the Beehive 150A Probe Amplifier to a spectrum analyzer. Cable length 30 cm. Spare Ethernet Cable 2 m.